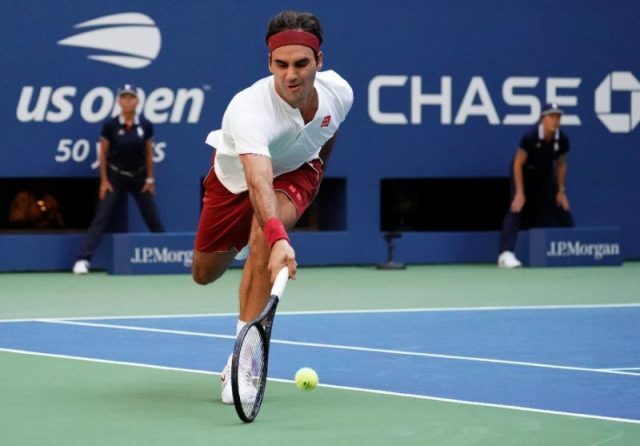 Roger Federer’s shot heard round the US Open on Saturday — a jaw-dropping forehand around the post in a straight-sets win over Nick Kyrgios — ranks as one of his most memorable, the Swiss great said. “It was definitely one of the more unique ones,” said Federer, who raced forward and wide on a sharply angled shot from Kyrgios, stretched and flicked a forehand around the post on Arthur Ashe Stadium. Federer said it was all instinct — it’s not a shot that can be practiced. “You don’t get an opportunity to hit around the net post very often, because in practice the net is out further and the court is more narrow. “For a shot like this to happen in a practice, you will will be running into a fence and you will hit it into the net. Kyrgios, already two sets down and deflated after squandering a rare chance to break Federer in the first, quipped that he should post some pictures on Instagram. Federer, a 20-time Grand Slam champion, said the shot ranked right up there with some of the most memorable of his career, in a group with his smash off a smash by Andy Roddick at Basel in 2002 and a lob flicked over Andre Agassi on break point in Dubai in 2005. Another one for the scrapbook: a between the legs effort against Novak Djokovic at the US Open in 2009. “I think it was 6-5, Love-30, it was just a big-time moment in the game, which obviously always matters as well,” Federer said.